The Association of Independent Festivals (AIF) has renewed its calls for a Competition and Markets Authority (CMA) investigation of Live Nation on competition grounds, after an AIF study found the company now owns or controls more than a quarter of British festivals with a capacity of over 5,000. According to the association, concert giant Live Nation controls 25.6% of UK festivals over 5,000 capacity – more than three times its nearest rival, Global, which has a marketshare of 8%, largely through Broadwick Live. AEG Presents (BST Hyde Park, All Points East) is third, at 5%. Following the research, AIF says it has “renewed its call for UK competition authorities to properly scrutinise Live Nation’s vertical integration and dominance, and the detrimental effect it has on the independent festival market”. Live Nation also owns Ticketmaster, along with artist management and sponsorship divisions. It has also introduced a ‘stamp of independence’ for “proudly independent” events to display on their websites and promotional materials. 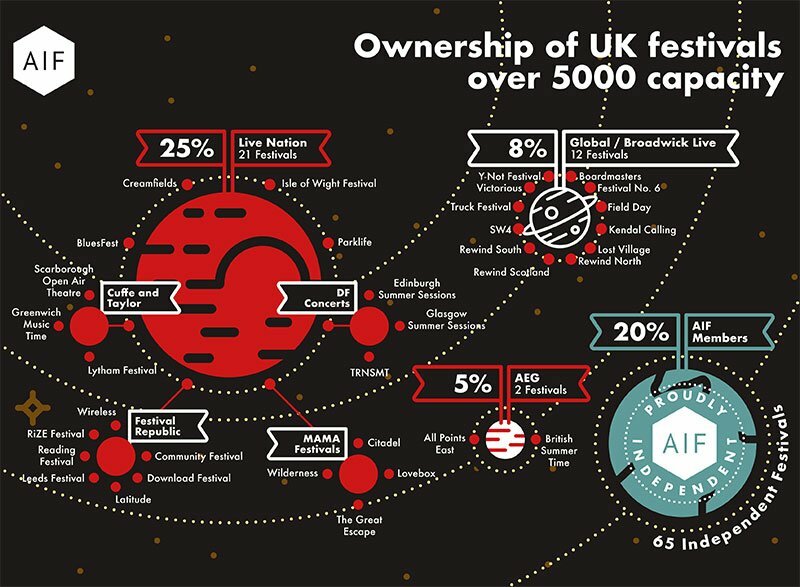 AIF chief executive Paul Reed says: “AIF’s festival ownership map paints a stark picture of the sector. Allowing a single company to dominate festivals, and the live music sector in general, through vertical integration reduces the amount of choice and value for money for music fans. It can block new entrants to market, result in strangleholds on talent through exclusivity deals and stifle competition throughout the entire live music business. “We have also today launched a stamp of independence to celebrate our member events and so that customers can clearly identify when they are buying a ticket to an independent festival.